Christmas is the perfect time for sugar cookies. 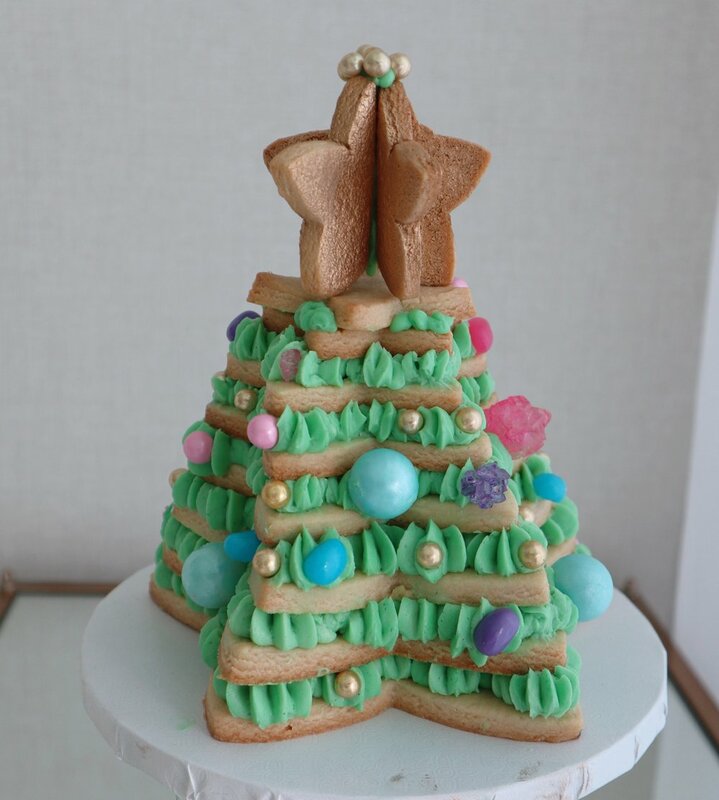 They are everywhere: Decorating tables, adorning the tree, as gifts, as ginger houses and just being the perfect activity to join everybody in the kitchen for a fun time. 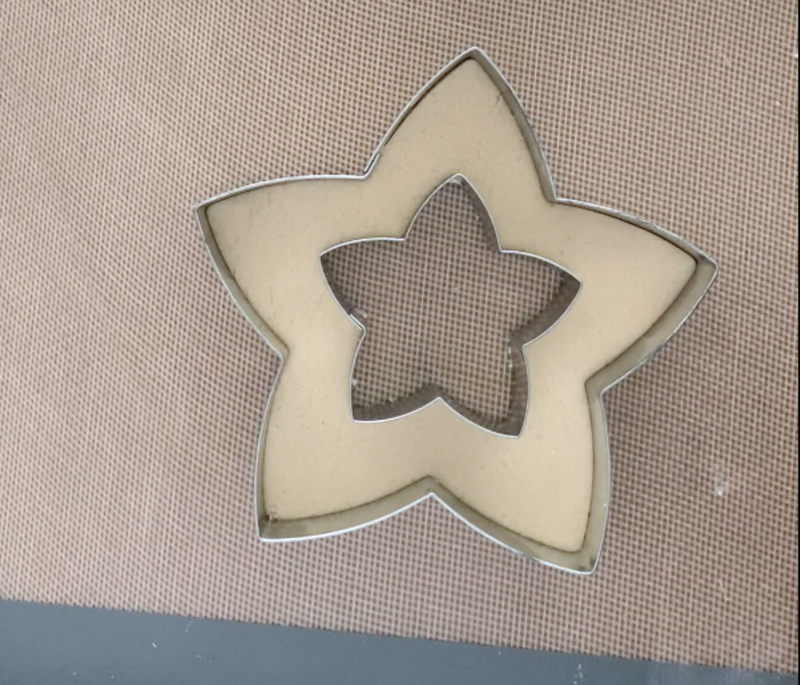 Here is the recipe I use for decorating cookies. It’s my favorite because I don’t have to wait for it to be cold to roll it. Still is a good practice to place the cut cookies on its tray in the cooler before the oven, because it helps them hold its shape. You can swipe the vanilla extract for almond, or even some lemon zest. You can also color the dough, but I find the shade that comes out of the oven a little dull, unless you add too much. I found this recipe in a great blog called Katrina’s Kitchen. Check her out she has great recipes and I love her pictures too. 3. Beat in extracts and egg. 4. In a separate bowl combine baking powder and salt with flour and add a little at a time to the wet ingredients. The dough will be very stiff. If it becomes too stiff for your mixer turn out the dough onto a countertop surface. Wet your hands and finish off kneading the dough by hand. 5. DO NOT CHILL THE DOUGH. Divide into workable batches, roll out onto a floured surface and cut. You want these cookies to be on the thicker side (closer to 1/4 inch rather than 1/8). 6. Bake at 350 for 6-8 minutes. Let cool on the cookie sheet until firm enough to transfer to a cooling rack. I had this idea to combine chocolate and pumpkin together, but how? For the chocolate part I have my eternal go to chocolate mousse I found on the book MIETTE. Everything in this book is special and delicious and more so when you taste it in person at their San Francisco Store. Now for the pumpkin mousse I had to try a few. Frist I tried one that used whipped egg whites, but the consistency was different between the two mousses. Then, I tried one with store bought custard in the ingredients. Very good but you can feel the “packaged” taste. Combine the sugar and water in a pan, bring to the boil, turn down to a simmer and cook for approx 4 minutes until the sugar is completely dissolved. Whisk the eggs yolks until thick and lemon colored. On a low speed pour in the sugar syrup until light and the mixture has doubled in volume. On a low speed add the melted chocolate to the egg mixture. Scrape down and whisk until fully incorporated. In another bowl whipp the cream until it holds soft peaks. Slowly add the chocolate mixture and the vanilla extract to the cream. Carefully use a wodden spoon to fold the chocolate mixture in to the cream untill uniform. Place rings on a tray lined with parchment paper. Start by pipping the chocolate mousse up to half the ring. Move to the refrigerator until it sets. Set in the refrigerator, then move to the freezer until you are ready to cover with the chocolate mirror coating. This is originally Jacques Torres recipe. Let’s start at the beggining, at New year’s. In Jewish tradition, Rosh Hashanah marks the start of a new year. This start has a very distinctive scent: the perfume of honey and spices. This enveloping aroma comes from a kitchen where the traditional honey cake, the Lekach, is baking. The delicious smell emmited from the mix of the ingredients makes the baking process an absolute joy. Once your cake is in the oven, the mixture of cinnamon, orange, coffee, spices, and honey will douse your house with the sweet scent of tradition and family. We made many loafs of these honey cakes at the bakery, which were sold out before they were finished. This is due to the customary jewish tradition of gifting them at the end of the Rosh Hashanah dinner. We baked A LOT of them, made sure they were decorated with beautiful ribbons for packaging, and reconnected with clients that come every year to make sure that everybody on their list gets a loaf. The big secret of our Honey Lekach? Mix the batter and let sit all night in the cooler. Let all of those different flavors melt together and soften the batter, and the next day, let it come to room temperature before baking. Add the honey syrup right after they come out of the oven. When cakes are hot they absorb the moisture better. ¼ cup (25g) sliced almonds. 1. Preheat oven to 350°F/170°C. Grease a 9×5-inch loaf pan. 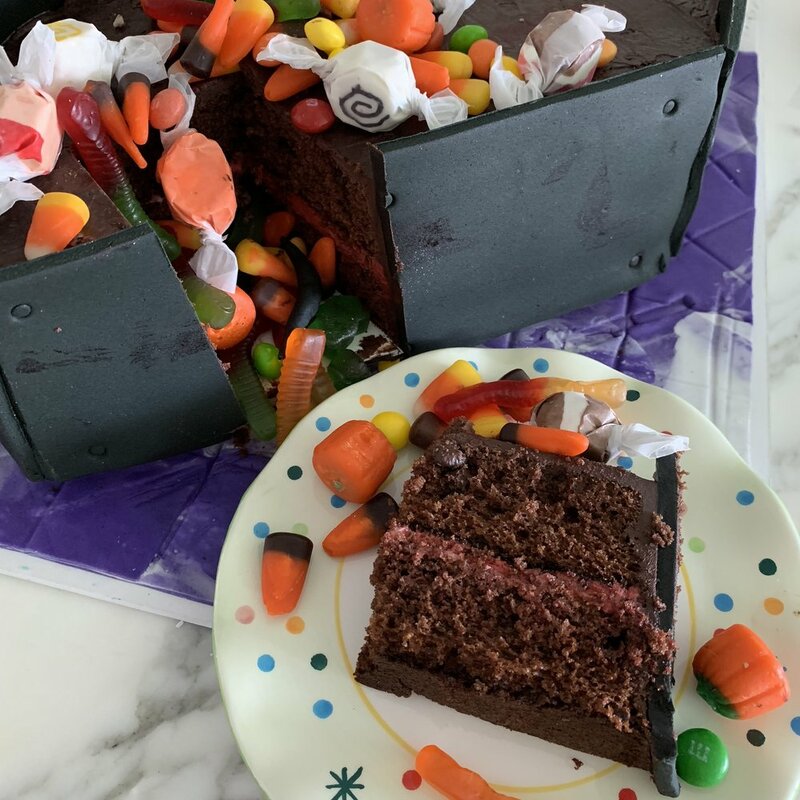 We used paper loaf molds for giving way as gifts. 2. In a large bowl, sift together all dry ingredients, flour, baking soda, baking powder, salt, cinnamon, cloves, and cardamom/nutmeg. Set aside. 3. Combine liquids together (orange juice and oil), add the coffee. 4. In a mixer bowl fitted with the whisk attachment, whisk together eggs, brown sugar, and honey on medium-high speed until light and fluffy, 2-3 minutes. Turn off mixer. Beat in the flour mixture in 3 additions, alternating with the liquids in 2 additions, starting and ending with the flour. Do not over mix. 5. To prepare the syrup, boil the honey and water together. When boiling, take out of the heat and add the liquor. 6. Cover the batter and place in the cooler overnight (optional). The next day, take the batter out and bring to room temperature. Pour the batter into a prepared loaf pan. Sprinkle with nuts. Bake for 35-45 minutes or until a toothpick inserted into the center of the cake comes out clean. If the top is browning too fast while baking, cover pan loosely with aluminum foil. Immediately coming out of the oven, pour the syrup on top until absorbed. Allow cake to cool for 10 minutes, remove from pan and set on a wire rack to cool completely. If using paper molds. Wait until completely cooled before wrapping. 7. Store cake in an airtight container or aluminium foil at room temperature for up to a week. Serve at room temperature.